What is an Inspection Notice Placard? Every Champaign-Urbana food establishment is required to display their most recent food inspection results by posting a color-coded Inspection Notice placard near the entrance or other approved location. Compliance status is quickly revealed by the color of the placard. Inspection Notice placards give immediate information to consumers before they make their purchases or dining decisions. At the establishment, consumers may also view full inspection reports by scanning the QR code on an Inspection Notice placard. 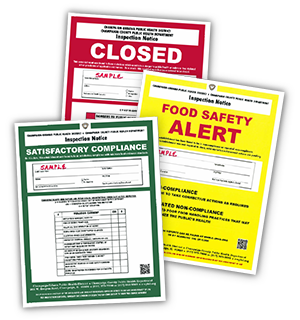 To learn more about Inspection Notice placards, click on the tabs above.